In the new comedy Book Club four lifelong friends get together each month and spice up their literary meetings with a reading of Fifty Shades of Grey. The film stars four Hollywood veterans, Diane Keaton, Jane Fonda, Candice Bergen, and Mary Steenburgen and by the looks of it, these women not only got along famously on screen but off screen too. Steenburgen's break came when she was discovered by Jack Nicholson in the reception room of Paramount's New York office, and was cast as the female lead in his second directorial work, the 1978 Western Goin' South. Steenburgen had a leading role in the 1979 film Time After Time as a modern woman who falls in love with author H. G. Wells, played by her future-first husband Malcolm McDowell. In her third film, she won the Academy Award for Best Supporting Actress for the 1980 film Melvin and Howard, playing Lynda Dummar, the wife of Melvin Dummar, then a trucker and aspiring singer, who claimed to have befriended reclusive eccentric Howard Hughes. Another notable film appearance came in the well-received 1983 film Cross Creek, in which she played Marjorie Kinnan Rawlings, author of The Yearling. In 1985, she also starred in the movie One Magic Christmas as a mother and wife who falls on devastating times at Christmas only to rely on a Christmas miracle to save her family. In Back to the Future Part III (1990), Steenburgen played Clara Clayton, a school teacher who falls in love with Doc Brown, played by Christopher Lloyd. She was persuaded to play the role by her children, as well as by fans of the Back to the Future films, and reprised the role by providing the character's voice in Back to the Future: The Animated Series. Other performances have been: in What's Eating Gilbert Grape (1993), as a woman who is having an affair with the title character (played by Johnny Depp); the role of Hannah Nixon in the Oliver Stone biopic, Nixon (1995); and in the Will Ferrell 2003 comedy Elf, as a woman who discovers that her husband is the father of one of Santa's elves. Most recently she starred as Gail in the now cancelled TV comedy series, Last Man on Earth and she has a recurring role as herself with her real life husband Ted Danson in Curb Your Enthusiasm. I had the opportunity to chat with the delightful Mary Steenburgen about Book Club and her new found friendship with her co-stars. 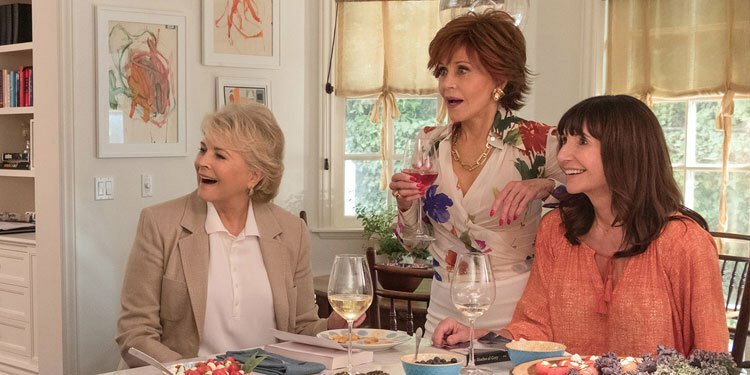 Book Club opens in theatres on May 18th.